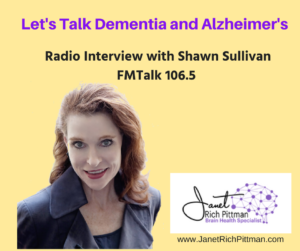 Radio FM Talk 1065 Sean Sullivan hosted me to talk bout dementia, Alzheimer’s and ways to increase our brain health to avoid the onset of this disease. Enjoy listening to our conversation [23 Minutes] (or you can read the transcript below) and let me know if you have any questions. Sean: FM talk 106.5 Midday Mobile. Glad to have you here. And my guest, The Brain Nerd in studio, Janet Rich Pittman, thanks for being here. Janet: Hey Sean, it’s a pleasure. Thanks for having me on your show. Sean: Okay I’m gonna…your nickname. Sean: The Brain Nerd. Okay, how do you arrive at being called The Brain Nerd? I mean, pretty cool. Janet: And so there it is, and it stuck with me ever since. Janet: Yeah, just because I’m always on the people to have good brain health. Sean: So, I mean, so you deal with the effects of dementia. That’s what you’re doing every day. Sean: Unfortunately that’s…is becoming more and more people it seems like, or at least the diagnosis is out there for more and more people. Janet: That’s right, Sean. The statistics are harrowing. Well, let’s just talk about it, 5.3 million Americans now suffer from Alzheimer’s. And in 2050, it’s supposed to go up to 16 million. Janet: Yes, those are millions. Janet: Right 5.3, but let’s put that in normal everyday statistics, okay? Sean: Okay. Yeah, something I can…put it in Sullivan-ease. Janet: Okay. So 1 in 6 Americans over age 62, 1 in 6, has some form of dementia. Now, statistics say really one in nine, but the majority of people or a strong faction of people have dementia which is not officially diagnosed. Sean: Will those people…you’re saying they just haven’t been diagnosed yet, or? Janet: Right, or don’t wanna be diagnosed. And they’ll have the dementia, continue with the dementia, and die from heart failure, or die from a liver disease, or some other ailment will get them, not dementia. They will not die from dementia. And dementia, by the way, is the number six cause of death in the United States. Sean: Right, so when it’s written down on the chart though, they died from heart failure. Janet: But really the dementia and Alzheimer’s cause the heart failure. Janet: Yeah, shed some light. But dementia, not only Alzheimer’s, let’s talk about dementia and Alzheimer’s, but first of all, dementia, Alzheimer’s number one, can be prevented, and number two, it can be cured. Sean: And we’ll get in to that. Janet: We’ll get to that. Sean: We have an hour. Sean: Is a form of dementia. Janet: These are all forms of…AIDS is a form of dementia. Sean: So college is dementia. So, I mean, so your…what falls under the umbrella of dementia is not specific to anything other than the loss of the brain cells? Janet: Right. It’s conditional. Those brain cells have to die in a quick amount of time in a significant section of your brain. So now what’s quick amount of time? Quick amount of time, well if you’re 62 years old, 5 years is pretty quick, 10 years is even, you know, it’s quick but it’s not as quick as 5. So 5 to 10, sometimes up to 50. I’ve seen cases and read cases 20 years for dementia to develop before symptoms ever occur. So here we are, we’re 62 and…or 65 or 70, we’ve been diagnosed, officially diagnosed, and we’ve been building, formulating, percolating dementia in our brains since in our 45, 50. Sean: But we don’t…do we not know it because is it the old, you know, the old adage, well, you got so much of your brain you don’t even use, or is it that other parts of the brain compensate for the parts that are gone? What keeps us from noticing…why does it…it’s progressing and then all of the sudden it gets to a point where we notice it or somebody else notices it. Janet: Actually, really, we do notice it. We just shake it off. “Oh,” slap the air, “Oh it’s okay. I’m just getting older, no big deal,” you know? “Oh, you know, I’m losing…oh, my energy, I don’t have any energy, you know, it’s okay, I need to get some more sleep, I need to quit drinking.” You know, all…we make all these excuses. We don’t realize it’s our brain. Our brain is faulting. We think it’s something else. That’s why I’m so…such a proponent for good brain health. Sean: Okay. And I wanna talk about that this hour, too. What…other than green tea, what else we can choose for…which I like green tea, I drink the green tea, I don’t know if I’m drinking the right green tea, it’s… But at FM Talk 106.5, Janet Rich Pittman, my guest in studio, The Brain Nerd, and we got a couple calls, had some people drop off here that had questions, but we got the questions during the break. One of ’em was the effects of…what was it, Prozac and some drugs on dementia…there we go. Janet: Well, no there really weren’t drugs specifically for dementia. Sean: No, those drugs for other things, do they have an effect for dementia? Sean: Wait a second. So drugs that are being prescribed now, the American people, for whatever it is, other conditions, you’re saying have an effect on dementia. Janet: That’s correct. There’re seven triggers for Alzheimer’s specifically, and toxins are one of them. For example Aricept is a big medicine that’s prescribed specifically for dementia. Well the World Health Organization has banned this medicine because it’s number one trigger for seizures. It’s a heavy seizure inducing proponent. So, really, our world as you know, Sean, is governed by the pharmaceutical companies. Seventy percent of all advertisements on TV are from this pharmaceutical companies. So we don’t really get the whole story. And doctors are trained as they’re coming into medical school, they’re trained to see a symptom and to treat that symptom, and they’re not trained for a whole body and a holistic approach. You know, in the ’40s and the ’30s, right after Depression, doctors would go into your home and they’d come…they make house calls, they go into your home, they spend 30 or 40 minutes with you, figuring out what you ate, if there’s mold where you’re sleeping on, if there’s…if your house is clean, is there mold growing around, what are your…what your toxin levels are, and then they would be better able to prescribe something to help you wholly, and that doesn’t happen anymore. Our business model for our doctors are seven minutes or less for a doctor to see you in their office, he or she to see you in their office, and then treat that one particular symptom, not really having any concept as to what it’s gonna do for the rest of your body. Sean: Well, that was an eye-opener for me. I never knew that there was…that these other drugs could cause that. So there’re…and if somebody wants to go…you were talking about your Facebook page too, there’s a good resource for this. Janet: Right. Yes, I post a lot of information on Facebook, and there’s a blog that I made, I wrote, called, “Zolong to Zoloft”, and it further explains a little bit more about that specific drug, Zoloft, and you can totally find that on my website too, thebrainerd.com, and go into the “My Blog” section and you’ll see it there, the “Zolong to Zoloft” blog article. Sean: I wanna talk about too, you know, your history before being named The Brain Nerd by your nephew there, your work under George W. Bush and political activism and now being in the health world. How do you bridge that? How did that happen? Sean: Yeah you all had to make a choice there, right? Janet: Right, right. And so I floundered around for a bit and mother said, “You know, honey, you were so good taking care of your grandmother when she was in the nursing home. Why don’t you look to look into this mental sickness when you get old?” Like, “Mom, it’s called dementia.” And so that’s how…it’s even before Alzheimer’s was really a common term in our society, and so I did. I went back to the association…Assisted Living Association in conjunction with UAB(University of Alabama Birmingham), became re-schooled, did an internship and a residency. I’ve facilitated over three facilities, managed overcome three facilities. And so now I freelance, I write, and I speak all over on dementia prevention, and dementia is not part of old age, dementia is a disease. Sean: Well that…okay and help me with this too because it seems like we, we not you, but for me and a lot of other folks use the term “dementia” and “Alzheimer’s” almost interchangeably. Sean: You’re talking to a lotta people now, Janet. Sean: With that, what can we do? If it’s happening right now, to folks, you say it’s percolating here, before we get these diagnosis, what do you do? How do you head this off at the pass? What…other than green tea, what can we be doing? Janet: First and foremost thing is you need to know your numbers. You know, what is your fasting blood sugar? Where do you stand with your cholesteros and your triglycerides? How’s your thyroid? Where’s your testosterone? Sean: And what about this…you hear that it’s heredity, that if you have a family history of it, then you’re gonna have a proclivity for it. Is that true? Janet: Yes and no. The majority of the people who have Alzheimer’s have the APO 4, they have two sections of those genes, two outta four of those genes. And if you have three or four of those genes, you’re really headed into the Alzheimer’s direction. But based on your DNA, you can change your genes, you can change your DNA. Sean: You can change your DNA? Janet: Yes, you can do that. And what…how you do that is through…really, you know what, let’s just get to the bottom of brass tacks. It’s really that…and there’s no really such thing as Alzheimer’s or dementia, you’ve got a gut disease or you’re got a liver disease. And what you put into your liver and what you put into your gut, if your liver and your gut can’t take away, it goes to your brain and you do the damage in your brain. So you’ve gotta look at all these things that are affecting your health. Again, what’s your BMI? What’s your blood pressure? How’s your hemoglobin A1c? And a lot of other people, like, even when you c-reactive proteins, you need to measure inflammation and see how…if you’ve got chronic inflammation going on in your brain. Sean: Wait a…so you’re saying the things that people would consider, the province of a gastroenterologist would be what you say is causing this dementia or Alzheimer’s? Sean: Okay, yeah, you’ve got me hooked. Man: FM Talk 106.5, the Gulf Coast’s weather authority and Dr. Bill Williams. Man 2: This is Midday Mobile with Sean Sullivan on FM Talk 106.5. Sean: 1:35, FM Talk 106.5 Midday Mobile. Glad to have you here. And my guest, The Brain Nerd, in the studio, Janet Rich Pittman. I wanna grab a call here on what we were talking about before the last break, and Tim is in Bay Minette, wants to talk some dementia here. Tim, you’re on with Janet. Tim: Hey, thank you both. Yeah, I wanna comment about your topic. The first part was…yes, the earlier comment. I have a friend who’s in his early 50s and used to be pretty quick at talking and what not, but now every now and then, a word’ll come out, like he oversteps his words or he spits ’em out too fast, have to slow down, catch up to ’em. Is that also part of, say, dementia or that would be classified the same thing as where, you know, he’s not able maybe to just commute…communicate as fast? And the second part of it, you know, Obamacare, or any care, will…how will you be able to manage, say, mental health, in the sense…I mean, when does a person have to go and say, “Hey, I can’t remember this or I can’t remember that?” How do you actually ask for that, so they can, say, maybe get on disability or whatnot for having mental problems without being crazy or crazy or something like that? I’ll hang up and listen. Thank you. Sean: But you were saying things like…numbers like cholesterol, triglycerides, those kinda things. Sean: These are the two numbers I don’t like the doctor to ever give me. Yeah, I don’t like…I’m not big fan of those numbers. Sean: Or my blood pressure. Janet: Okay, well, but, you know what, it’s not your heart that’s the problem with your blood, it’s your brain. Not only your heart’s having trouble pumping the blood, but it’s having trouble pumping your blood up to your brain. Okay, now where do we get…how do we get nutrients in our brain? Through our blood. Blood has got to go to your brain and work and circulate in your brain. And it’s not so much your blood vessels and your blood arteries, but your capillaries. You’ve gotta really force that blood way deep into your capillaries. And the capillaries are the first to go, causing ill brain health when your triglycerides and your cholesterol are jamming up your blood vessels and your blood arteries full of plaque. Sean: Okay, these two conversations, I think, come together though, when we mention…you said you think that under some new version here, we’ll call it Trumpcare, for lack of a better term right now, that there…one of the changes will be maybe less services for seniors right now. But we’re talking about a situation here where you’re laying out a case…I mean, as the obesity rate increases in the country, if I’m using your logic, therefore to it, the dementia cases, Alzheimer’s cases would increase because along with that will come reduced blood flow, higher sugar levels, higher cholesterol, higher blood pressure, right? Sean: So it seems like a calamity coming. Janet: As your blood pressure goes up, your blood flow to your brain goes down and your brain starts to shrink. And it quits…doesn’t function correctly and properly. Sean: So, I mean, so as they’ll be less funding for these things, possibly, going forward, you’re saying you’re seeing a continued increase of cases of…whether it be dementia or Alzheimer’s, something like that. Janet: I am. Back to the question at hand, so we’ve talked about your friend and his losing words, and then you’re talking about when do you go and get the diagnosis, official diagnosis that you have the Alzheimer’s. Well, many people, again as we’ve talked about when we opened this show, don’t do that because they’re afraid that once they get the diagnosis, then that’s their calling card, their calling card death, their card that death is on the way. And that’s not the case at all because again, Alzheimer’s, you can fight it, you can…I have seen hundred cases where it can be reversed. 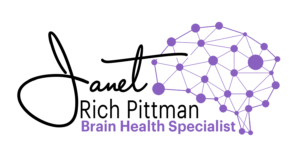 You just got to know…you’ve gotta have good brain health, you’ve gotta know your numbers. Sean: There it is. Coming back, more with Janet Rich Pittman, The Brain Nerd, as her handle goes. And we’ll talk about this, we’ll take a few more questions at 343-0106, 343-0106. It’s Midday Mobile on FM Talk 106.5. Man: This is Midday Mobile with Sean Sullivan on FM Talk 106.5. Sean: Hey, welcome back. Midday Mobile on FM Talk 106.5. This segment of the show brought to you by Harry’s. All right, continuing our conversation with Janet Rich Pittman, The Brain Nerd, in studio, and I wanna grab a couple calls here. Mike is in Mobile, and Mike, you’re on with Janet. Mike: Hi, how are you? Mike: Listen, I suffered a 2013 stroke. And my later stroke was November this year. But I was wondering how strokes may affect, or coincide with dementia or Alzheimer’s. Janet: Yeah, Mike, we were talking earlier about blood flow. And the problem with having a stroke is that you have a vessel explode in your brain, right? There’s too much plaque, something’s happened. And it depends on the damage of that stroke, depends on where it exploded in your brain. And so, consequently, yes, dementia’s a factor, its called vascular dementia, that’s a type of dementia. And it’s caused because it hits your hippocampus or the internal cortex around your hippocampus, is where you make your memories. Now, you say your memory has increased. Well, its because probably you didn’t hit it close to the hippocampus, your stroke wasn’t close to the hippocampus, and you’ve been able to perhaps…you probably exercised, you’ve decided to eat right, you made some lifestyle changes, and so consequently you’ve become a healthier person. And you can absolutely, depending on, again, depending on where the stroke has affected your brain. Mike: My stroke, the first stroke from the MRI is my right temporal and the back of my brain. Janet: So see, that’s not near or close to the hippocampus, so that’s good. Mike: Now, I don’t wanna mislead you on my memory, what kinda drove that comment was friends and relatives that would come see me and visit with me after my first stroke since then, since 2013, we would just sit around talking, as we do, and I would bring stuff up that…from my early, early childhood, that they had no recollection of things and I would jog their memories on it. And I’ve always been complemented on, “How in the world can you remember this kinda stuff?” And then with friends as well, high school friends that I still have bring up subjects and things that happened, and they were just dumbfounded at the fact. Janet: Once you make your memory, Mike, you have sensory memory, and then that, that’s like, “Oh it’s cold outside,” then you’re say like, “Well, lets see, I gotta get a sweater.” So then you work on that to get your sweater. Its called working memory. And then you’re working so much into this coldness and needing a sweater, that turns into short-term memory, because you’re going to your buddy’s house for a cookout and you gotta be dressed warm. So that comes into short-term memory. And then if you had a great time at that cookout, then that comes in and your brain figures out, “Well, is it worth remembering that or is it not worth for remembering?” And so its that depending on your memory and what you wanna remember, that goes to different parts of your brain. Right? So consequently, the area of your long-term memory wasn’t affected by your stroke, and so that’s why you’ve been able to quickly recall these long-term memories. Usually when you have a stroke or any type of dementia, the first thing to go is your short-term memory and your…actually, really, your sensory memory and your working memory to develop your short-term memory. So you have really…have a blessing that your strokes have not caused any additional vascular dementia. And just may I encourage you to eat right and always exercise five days a week, get your walking shoes on and take a walk. Sean: All right. Tell you what, we’re gonna have to…because we got people holding on here, we’re gonna have to do this again Janet, have you back on the show. Janet: Thanks, Sean, it’s been a pleasure. Sean: All right, we’ll get you back on in the future and talk more about this. So much to talk about. This is affecting so many families out there, so many…our listeners, so we’ll do it again really, really soon. Thank you. Your Facebook page, people wanna go get more info. Sean: Brain Nerd on Facebook, go check it out. Janet: And my website as well, www.thebrainnerd.com. Sean: I like the theme, I get it. All right, Brain Nerd, we’ll talk soon.